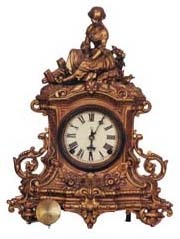 Ansonia Brass & Copper Co. metal case mantle clock, "Evangeline", a 1874. Pictured in the company\'s "1874 Catalogue of Clocks", for sale. Case was made by N. Mueller, N.Y. The gilded metal case is 19 inches high. Movement is 8 day, strikes on a coil gong. The front is iron, a wood box in back to hold the movement. Pendulum is attached from the bottom. Repainted dial on the old zinc pan. Case is very clean and will run if you put it in beat. Ly-Ansonia No.1413.